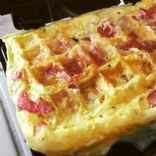 I've been seeing all kinds of Pinterest pins for making omelets in a waffle iron. So, I decided to give it a go. My waffle iron (makes two at a time) can only take 3 eggs at a time (as I'm still wiping egg off my counter). It took about 3 minutes for a simple and tasty omelet! I'm making this again. I want to have more fiber in my diet, and less red meat. This soup is easy to make, heart and delicious! This recipe makes a LOT and freezes very well. The secret to making thick and creamy soups is to add one potato while simmering your vegetables. If you have an immersion blender, you can puree your soup to be nice and silky. If you don't have an immersion blender, then puree this soup in two batches. What I like about this method of cooking potatoes, is that you get that roasted potato taste, from the stove. This is convenient, when I need the oven for something else-- plus, I think it's just plain fast! I use a non-stick skillet with a tight fitting lid-- that way I don't need to use much olive oil. Sometimes I use small Yukon Gold or red potatoes-- but I love fingerling potatoes that best. Because I have diabetes, I need to eat more protein and less "starchy" carbs. I made this quick breakfast dish in 5 minutes, and I was so happy with the flavor, that I decided to photograph it and share it! I buy bagged fresh spinach as a grocery staple. I make this fast side-dish because we love spinach, it's flavorful and it's healthy! I'm a foodie. I can't help myself. Chicken can be boringly bland. My favorite way to make a quick meal is to sear and roast my protein, then finish roasting it in the oven (just like the restaurants do). I made this dinner in 20 minutes, and it was delicious! Olive oil and pure butter are good Omega-3 fats, and our body needs that. The key is to not overdue it. My mother was born and raised in Bavaria. Our family loved red cabbage. She is gone now, but I've adapted her recipe with just the right ratio of ingredients to make it just like hers! The key is using red wine vinegar. This freezes very well, too, but there aren't leftovers when I make it for family get togethers. My family loves Thai food. I was happy when I found this recipe, because it captures all the authentic flavors of a Thai restaurant. If you want a soup with less fat, it is possible to substitute light coconut milk for one or both cans of regular coconut milk. Fresh lemon grass can be omitted, but the soup will lack some complexity. Don't be tempted to use jarred or dried lemon grass-their flavor is characterless. If you want a spicier soup, add more red curry paste to taste. I have found these ingredients in my major chain supermarkets, in the International section. Fresh lemongrass is also available at my grocery store. For a more substantial meal, serve the soup over 2 to 3 cups of cooked jasmine rice. The soup can be prepared through step 1 up to one day ahead of time and refrigerated, but it should be completed immediately before serving, as the chicken and mushrooms can easily overcook. You can, certainly, substitute shrimp instead of chicken and it will taste delicious. I discovered this recipe about 5 years ago in a magazine. This has become a family staple. 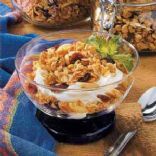 My favorite power snack is 1/2 cup of this granola with 1 cup of non-fat vanilla yogurt. I store this in an air-tight container, but it is gone within the week. I've tweaked a couple of things, in that I prefer dried cranberries instead of dried cherries. I love mashed potatoes. I don't believe that mashed potatoes are fattening, because I can get fiber, vitamins and potassium with this side dish. I am convinced that Yukon Gold potatoes make the BEST mashed potatoes-- even more than russet potatoes. TECHNIQUE is another secret to great mashed potatoes and my secret weapon is my food mill. You don't HAVE to use a food mill but it's the easiest way to make fool-proof mashed potatoes. Before I started to be more health conscious, I used regular cream cheese and heavy cream-- which tastes sinfully good. But, I've given up heavy cream for a combination of low-fat milk and buttermilk. I do not use fat-free half and half, because of the high fructose corn syrup...you certainly can, if you choose. I originally watched Giada DiLaurentiis make a similar recipe with swordfish and eggplant. I don't care for either of those, so I improvised using fresh halibut and zucchini and summer squash from my own garden. This is quick to make, has beautiful colors and it has a flavorful and fresh taste. You can certainly substitute any kind of fish, shrimp or even chicken if you prefer. This is my "go to" pasta dish when I want to eat vegetarian and to make something really fast. If you can find ready-made pizza dough, this comes together really fast. I'm fortunate to live near a Trader Joe's where I can buy freshly made pizza dough that doesn't come in a can. I also make my own Italian seasoning, using equal parts oregano, marjoram, basil, thyme, rosemary and whatever else you like. This is a basic recipe that I use when I sear any kind of meat-- I don't think that searing meat is fattening, because I use a non-stick pan with a maximum of 1 Tbsp of olive oil. This recipe has been made over generations in my family. Traditionally, the crust is made with unsalted butter, flour and a little sugar. Italian Prunes are used; they are different than traditional plums because they have a yellow skin. These come into season around the fall, and can be tricky to find. This is a vital ingredient to use-- traditional plums don't work for this! Cinnamon-sugar and melted butter is added on top of the tart-- I'd tell you the Bavarian name, but you could never pronounce it! "TZVE-TZIN-DATCHI". To speed things up, today, I used a quality pre-made pie crust from Trader Joe's. This recipe is for 4 servings, but you can easily make a larger batch to keep on hand. I make my own taco seasoning, which is very simple to make. To find that recipe, just search for "Taco Seasoning". Add 19 calories per serving for the taco seasoning. You can substitute the beans if you prefer black beans or kidney beans. I don't use Splenda, though, because I don't consider that ingredient to be "natural" and good for our body. It's up to you, though! Stove Top mix is no longer in my pantry. Making stuffing, from scratch isn't that hard to do at all! Each serving is based on 1/2 cup serving. I don't eat a large mound of this, to watch calories. NOTE: You can also make this dish in a crockpot, if you have the time. It doesn't have to be Thanksgiving to make a turkey dinner. I like to buy Free Range Turkey breast tenderloin, no skin for a fast and healthy meal. This sauce is a "must try" with my Balsamic Marinated Pork Loin and Low-Fat Parmesan Polenta. When I plate this menu, I put a layer of polenta, then sliced pork tenderloin and this lemon-honey sauce on top. It's a fantastic meal that gets five stars from my family! This is a fast recipe and very tasty when made with my Lemon-Honey Sauce Recipe and Low-Fat Parmesan Polenta. The entire menu can be on the table within 30 minutes, I promise! Recently, in Glen Ellen, CA I had the Sonoma Salad the Glen Ellen Inn. It was so good, that I figured out how to make the Honey Dijon Vinaigrette to serve on a bed of lettuce, chopped grapes, apples and blue cheese. I made a few substitutions to reduce fat. I am fortunate to shop for all of my ingredients at my local Trader Joe's. Polenta: butter and cream lurking in side dishes and desserts can put an end to good eating intentions. But it's possible to have sides and desserts without overindulging. In the case of this polenta recipe, simply tweaking the cooking technique completely changed its composition. Normally, dry polenta is sprinkled into boiling water. But bringing the polenta to a simmer in water and milk, gives it a smooth, rich quality without the need for butter or cream. A hit of Parmesan at the end adds richness and flavor. This is my fast, easy method to serve fresh salmon. Sometimes I keep it simple with salt & pepper. Other times, I might use lemon pepper, herbs...use your imagination. What my family loves about this method, is that the salmon turns out moist with a crispy, crunchy outside. The secret to good mashed potatoes is to use a food mill-- I leave the skin on, and the mill will take care of peeling the potatoes, too! DO NOT use a food processor or blender. It will result in a very sticky and rubbery end product. This recipe was originally written to use a lot of heavy cream and 1 stick of unsalted butter. I wanted to figure out how to slim it down, but get creamy delicious results. It worked! My tips for avoiding watery mashed potatoes is to drain the potatoes and return to the pot on a very low heat for 1 minute. This lets all the water evaporate. THEN, use a food mill. I will never use a potato masher again! You get creamy potatoes without needed a lot of cream. One of the best recipes I have made, the glaze is the best part This meatloaf is different because of the combination of chuck, veal and pork. That makes it a little pricier, but this recipe is truly so good that my family devours it. I've yet to try it as a sandwich, the next day, because it's all gone! Panna Cotta is an Italian dessert meaning "cooked milk". I think of this as a custard, without the eggs. Heavy Creme and/or whole milk are traditional ingredients, but I wanted to lighten this up. I don't use fat-free half and half, because it has high fructose corn syrup and non-fat milk doesn't work as a substitute. My favorite way to serve this is with a rasberry coulis sauce, but you can experiment with any kind of fruit sauce you'd like. It's a very light dessert-- refreshing but not too filling. A fast and healthy alternative to traditional chili, that is made with ground chicken. Great, served over brown rice. This is one of my favorite vegetarian sandwiches. Don't skip the peperoncini, as these mild Greek Peppers are what really gives the sandwich a great kick to it. 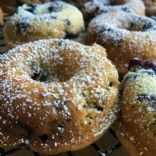 I developed this recipe from a class I took at the Culinary Institute of America. I substituted low-fat ricotta cheese for marscapone and elimined a HUGE percentage of the butter by roasting the peaches in the oven, instead of in a skillet. It's a family favorite. This dressing is a bit thicker and yields about 1 1/4 cups. Serving size is based on 1 Tablespoon. This dressing is perfect for my Debby's Salinas Salad that has greens, chopped fruit and nuts. I watched RR make this and so I checked the ratings. It's for dinner tonight, so I thought I'd enter it to check out the nutrition. I adjusted the recipe for to be HALF the ingredients that RR called for (2 pounds of lamb was too much). I'm glad that I did, because even halved, the recipe made 8 beautiful pitas-- stuffed with cucumber, tomatoes, sprouts, peproncini, onion. It's delicious! NOTE: I deleted the french fries with gravy for obvious reasons, on the menu. This is my idea of "fast food". Prep time is about 10 minutes (including marinating). I originally saw Rachael Ray make this a few years ago, and this is now a regular request in my kitchen. I got this idea from Rachael Ray, originally. I prefer to eat burgers, protein style, without the bun, though. It's a fast dinner that is really satisfying. 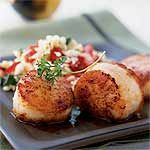 This recipe comes from Rachael Ray and this is a family favorite. It's delicious served over brown rice, or even coconut rice.